The community campaign to save The Queen’s Head, supported by Chalgrave Parish Council, is now looking for investors to pledge or buy shares in the Tebworth Community Pub Ltd. Time is running out to save this important community asset so please read the new information leaflet and make a pledge to buy shares. It is also now possible to complete the pledge form online. If you have any queries at all relating to the pledge or purchase of shares, please contact the Company Secretary, Roger Masters on 01525 873039 or email roger.masters@btinternet.com. If you know anyone who may be willing to invest, please pass these details on or contact us in order to arrange an introduction. 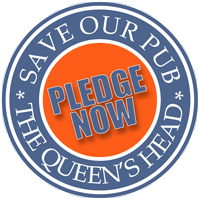 if you want to keep updated with all that is happening in the campaign to Save the Queen’s Head, please join our mailing list and follow us on Facebook.